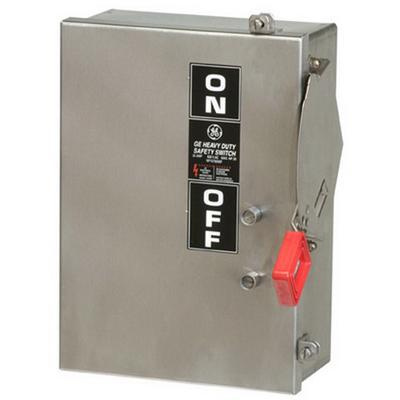 GE Industrial Spec-Setter™ Type TH 2-Pole 3-Wire heavy-duty safety switch is rated at 30-Amps and 240-Volt AC at 50/60-Hz. It has power rating of 1-1/2 hp at 240-Volt AC for 1-Phase, 3 hp at 240-Volt AC for 3-Phase, 3 hp at 240-Volt AC for 1-Phase, 7-1/2 hp at 240-Volt AC for 3-Phase and 5 hp at 250-Volt DC. Surface mountable switch features stainless steel construction. It accommodates 14 - 8-AWG copper wire and 12 - 8-AWG aluminum wire. Fusible switch features direct drive, quick-make and quick-break mechanism for easy switching operation. It measures 11.3-Inch x 7.4-Inch x 4.9-Inch. Switch uses Class R cartridge fuse for providing protection to low-voltage electrical installation against short-circuit/overload current. Spring reinforced fuse clips ensure reliable contact for cool operation. It has donut handle that is suitable for hook stick operation and accepts three padlocks in the Off position. Switch is perfect for commercial and industrial applications where safety, high-performance and continuity of service are essential. It has NEMA 4/4X rated enclosure for water, dust and corrosion resistance. Switch is UL listed, CSA certified, GSA compliant and meets WS-865C Federal specification.